Karaoke brings out strange talents in me - I can remember the lyrics to my Primary 6 jam (read: "Oops! I Did It Again") and spit Jay Chou raps like Mandarin is my Mother Tongue (oh wait, it is). If you're addicted to singing, you'd know that KTVs are not cheap. 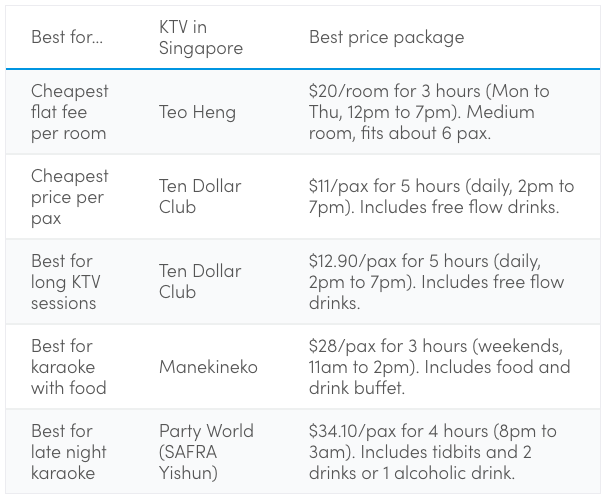 Here are the prices for the top 4 karaoke chains in Singapore - Teo Heng, Ten Dollar Club, Manekineko (the new KBox) and Party World. 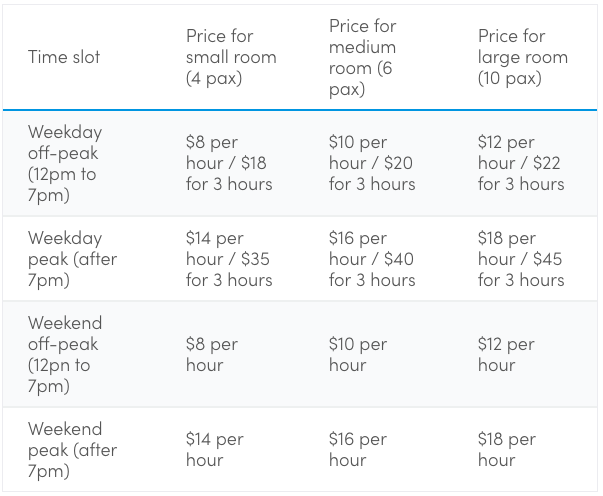 Teo Heng is the only karaoke chain in Singapore that charges by the room (instead of per pax), making it significantly cheaper than the other chains no matter what time slot you choose. Note: Weekend prices apply on Friday, Saturday, Sunday, public holidays and eve of public holidays. There are 3 room sizes - small is for 4 pax, medium is for 6 pax and large is for 10 pax. However, these are just recommendations, and you can usually get away with 1 or 2 more people if you don't mind the squeeze. 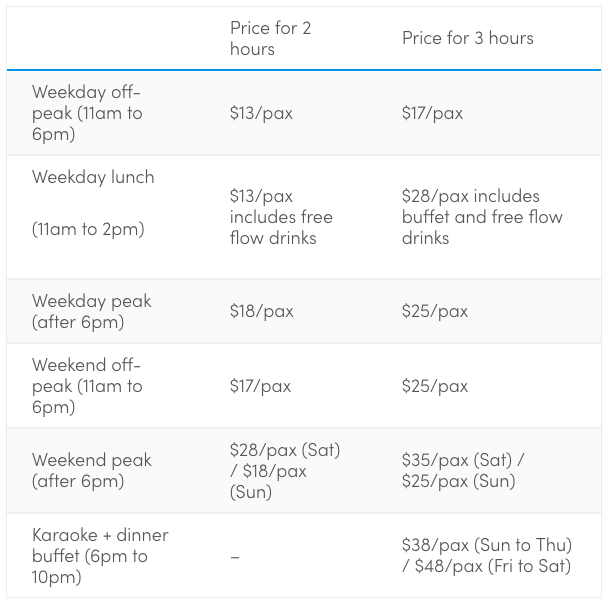 Assuming the average party is 6 pax, the cheapest time to go is on weekdays before 7pm. It's $20 for the whole group, which is $1.10 per hour per pax. That price is literally unbeatable. But unless you're a lazy student or idle tai tai, you're probably not going to be able to make that time slot. If you don't mind heading there after work on a weekday night (after 7pm), it's only $40 for 3 hours ($2.20 per pax per hour). 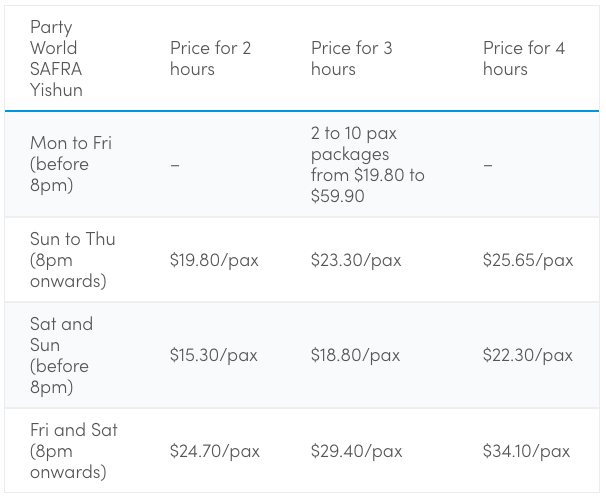 The 3-hour package doesn't apply on weekends, but it's still cheaper than the rest. The rates are for their 7 heartland outlets at Junction 10, Katong, Star Vista, Sembawang Shopping Centre, Causeway Point, Tampines Hub and Ci Yuan CC. 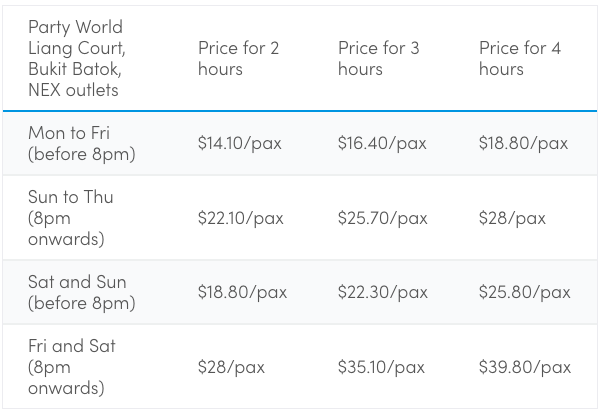 The prices at their Suntec and Rendezvous Grand Hotel outlets are a few dollars more expensive - check out the prices are on the official Teo Heng website. For per head charges, Ten Dollar Club has the best prices. Don't be fooled by its name though - it's not really $10. All the prices are listed on Ten Dollar Club's website as $10, with varying levels of "taxes" (i.e. $10+ and $10+++), presumably to stay true to its name. There is no note on what each '+' is for, so I called up for the prices. To be honest, I don't really care what they're for - all I know is that Ten Dollar Club is the second cheapest KTV in Singapore, and is especially good for super long karaoke sessions. 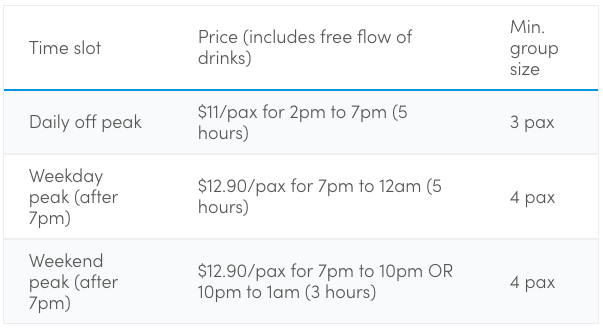 Ten Dollar Club's weeknight rates are $12.90 per pax for 5 whole hours, from 7pm to midnight. That's $2.60 per hour, and includes free flow drinks! The price is the same on weekends, but the 2 sessions are in 3-hour blocks. There are 3 outlets, but none are in town. The more central one is Chinatown, while the other 2 are in Downtown East and Balestier. You probably remember KBox, the Party World doppleganger with similarly obiang furnishing. I'm no fan of the flashing lights and mirrored walls, so I'm quite happy they were replaced by microphone-wielding fortune cats when Japanese brand Manekineko bought over the chain. Manekineko's prices are affordable, but the thing that truly sets the chain apart is the food. Got buffet leh. Of course we're sold. If there's one near your workplace (and you have a very generous lunch break), you can rap about "work, work, work, work" on weekdays between 11am to 2pm. The lunch KTV and food buffet is super worth it ($28 for 3 hours). On weekday nights, the 3-hour buffet bundle is $38 from Sunday to Thursday, and $48 on Friday and Saturday. If you want to sing on weekends, but aren't prepared fork out $48, skip the buffet and go in the afternoon. It's almost half the price at $25 for 3 hours. Manekineko has 10 outlets in total, most of them being in the central region (like Orchard Cineleisure, SCAPE, Bugis+ and Marina Square). Party World's Downtown East outlet recently shut its doors (June 2018), but the long-running chain still has its fans. It's the most expensive karaoke chain, but it's also the only one that opens way past midnight, making it the best for late-night sessions. The Liang Court, Bukit Batok and NEX outlets have the same prices, and are slightly more expensive than the remaining 2 outlets (SAFRA Yishun and Woodlands). If you feel the need to sing your heart out after some drinks, head to the Liang Court outlet - it opens till 6am (daily). The rest close at either 2am or 3am. The SAFRA Yishun outlet has the cheapest prices, with special weekday Happy Hour packages. The off-peak time slot is 5pm to 8pm, and is the most worth it if you come in a party of 10 ($2 per pax per hour). If you don't want to share the mic, you can come in a pair and still get a pretty sweet deal. 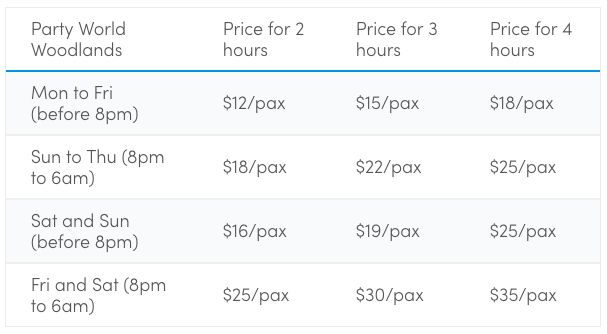 It's $19.80 for 2 pax, which is $3.30 per pax per hour. Of course, most people won't be able to make for those odd hours. Thankfully, prices are still significantly lower than the other outlets on weekend nights. For 3 hours on a Saturday night, you can save $5.70. Party World's last outlet is at Woodlands, where prices are in between the above-mentioned ones. It's slightly more expensive than SAFRA Yishun, but cheaper than the rest.